Have you ever wondered why Tai Chi Chuan is called Tai Chi Chuan, why this effective martial art is widely practised for health, why we normally perform its movements slowly, and why many students gain such a small portion of the tremendous benefits that can be derived from it? An understanding of yin-yang will provide us with answers to these and other questions. Yin-yang is probably the most widely used Chinese concept in the English language; it is also one of the most misunderstood – even among Chinese! Many scholars, for example, give the impression that yin and yang, representing the positive and the negative or the male and female principles, are the two primordial forces operating the universe, or the two fundamental ingredients that make up the whole cosmos. This interpretation is quite wrong, despite its popularity among otherwise authoritative figures. Yin and Yang by themselves are neither forces nor ingredients; they are symbols and may have different meanings in different contexts. So at times they may symbolise forces or ingredients, cosmic or otherwise, but they do not always do so. While its manifestations are many and often profound, in its simplest form the concept of yin and yang refers to the two opposing yet complimentary aspects of everything in the universe, be it an object, a process or an idea. For example, if we talk about looking up at the sky, “up” and “sky” become meaningful only when we relate them to their corresponding aspects of “down” and “earth”. We usually do this unconsciously, because we have become so familiar with these terms, but we do it none the less. In other words, “up” and “sky”, and “down” and “earth” are two opposing yet complementary aspects, which give meaning to each other. If there were no “down” and “earth”, there would be no “up” and “sky”, and vice versa. If we were deep in outer space, “up” and “sky”, or “down” and “earth”, would be meaningless. One of the two aspects is designated as yin, and the other aspect as yang. In this example, “up” and “sky” are conventionally referred to as yang, and “down” and “earth” as yin. Now let us look at the sky, which is yang when compared to the earth, on its own. If it is overcast and comparatively dark, we may refer to it as yin compared to other times, when it is bright and sunny. However, if we compare this overcast sky with the way it is at night, then it is yang, as it is brighter than the night sky, even though it is dark when compared to sunnier days. Hence, we can see that yin and yang, as manifested by “dark” and “bright” here, are relative as well as complementary. Yin and yang are two aspects of one unity or holism. This unity is usually expressed in a diagram known as the Tai Chi symbol. 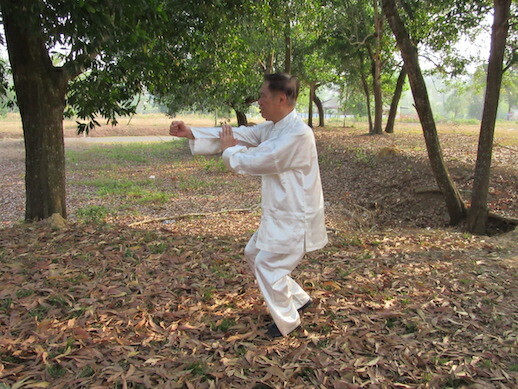 Tai Chi is usually translated as the cosmos. Notice that the symbol is perfectly symmetrical from all angles. This superbly symbolises the opposing yet complimentary aspects of yin-yang. Notice also that yin begins when yang is at its maximum, and vice versa. The concept of yin-yang and its Tai Chi symbol are used in many other disciplines besides martial arts. They are particularly significant in medicine, alchemy, divination, astrology, geomancy and Taoist philosophy. In Chinese medical thinking, for example, we often hear that yin-yang harmony is essential for health. Like a mathematical formula, this is a concise but great principle that can manifest in countless situations in health and medicine. The Tai Chi symbol is the main motif in Taoist illustration, symbolising, among other things, the physical as well as the spiritual in Taoist philosophy.